← Is It Okay for the Elderly to Own Pets? 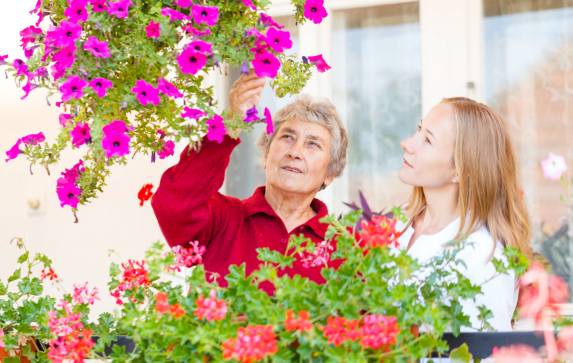 Growing plants is one of the recommended hobbies that senior citizens can engage in. Hand in Hand Home Care Solutions also believes that through this hobby, the elderly will feel fulfilled from sustaining and maintaining life. But not all plants are easy to grow. For this reason, if you plan to engage in this hobby, you should choose only those that won’t take much effort and time, and opt for growing those that you can sustain inside your home. Aloe plants. To grow an aloe plant, you need to detach younger clone plants from the base of the adult plant or from the joint root system, and transplant it in a pot. You also need to expose the new growing aloe to sufficient sunlight and water it every day. This aloe plant will not just give you leisure, but its gel could soothe burns and cuts, cleanse the surrounding air, and provide other healing properties. Snake plants. This easy-to-maintain plant is another good choice for an elderly person who wants to grow plants at home. Cuttings from an old snake plant could be put on free draining soil. Once they are propagated, you would just need to place them in a corner with indirect sunlight and water them thrice a week. Snake plants are best placed in the bedroom, because unlike other plants which absorb carbon dioxide and release oxygen during the day, these plants do so during the night. Thus, this will also be a good choice for those who need Home Care in Florida. English Ivy. NASA scientists have discovered that English Ivy is the best air-purifying houseplant because it easily absorbs harmful toxins in the air. Once you put this in a pot, it will grow on its own, and can be trained around a sculptural form. But you must only put it under direct sunlight for four hours to keep it in steady moisture. Rubber plants. This is among the plants which are best put in the seating area because of its natural air-cleaning capacity. To grow rubber plants, you have to balance the amount of sunlight and water. It should be put in a place where it receives indirect sunlight. During the first weeks, it needs to be steadily moist and after that time, you would only need to water it twice or thrice a month. Spider plants. You do not need to be a green thumb to be able to grow spider plants; hence, this indoor plant is a good candidate for individuals who engage in gardening for the first time. This would also be good option for those who need Home Care Services. After putting the plants on well-drained soil and indirect sunlight, you would only need to water them regularly to keep them alive. Aside from being a good decor at home, spider plants are also good at fighting pollutants like benzene, formaldehyde, and carbon monoxide. Getting into gardening will not just be a hobby, it can also make you feel better about yourself, knowing that you are rearing a living thing. This entry was posted in Home Care and tagged Gardening, Hobbies, Senior Care. Bookmark the permalink.